Do you have what it takes to be in the ring on National TV? Here is your chance to prove it. If you think you can hang with the BIG BOYS, come and find out from the Legendary Earl "Damn right I did" Hebner and Brian “Voted Best Ref " Hebner. You see them EVERY week on TNA IMPACT Wrestling. Learn from the men who have reffed over 12,000 WWE, TNA Title matches. Why go to a seminar where they take your money and rehash old times, or older guys who never get in the ring. Find out what the big boys are looking for RIGHT NOW! Warm-ups begin at 12noon. 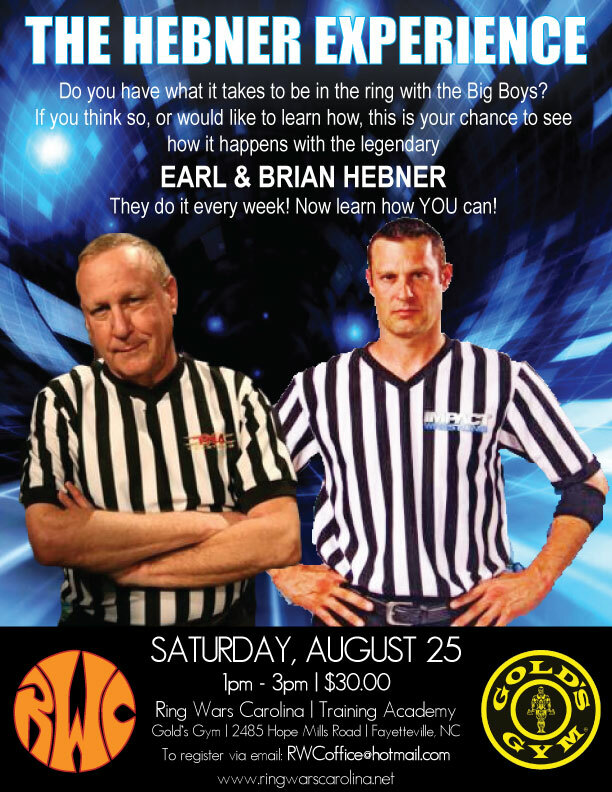 Hebner Experience starts at 1pm to 3pm. The Cost for this once-in-a-lifetime chance is only $30! Compare that to the others! See you at Ring Wars Carolina Training Academy!